At the beginning of the year John Adams asked his students to dedicate themselves to the greater good. In the wake of the 49 Fire, they did just that. Adams’ Placer High leadership class stepped up to help their community, proving themselves equal to the challenge. The class collected about $3,500 for fire victims at a fundraiser on Sept. 8, according to class treasurer Brigitte Creencia. The evening’s festivities included a battle of the bands, a barbecue and a volleyball game that pitted superhero-costumed teachers against the girls volleyball team. Adams said donations are still coming in. 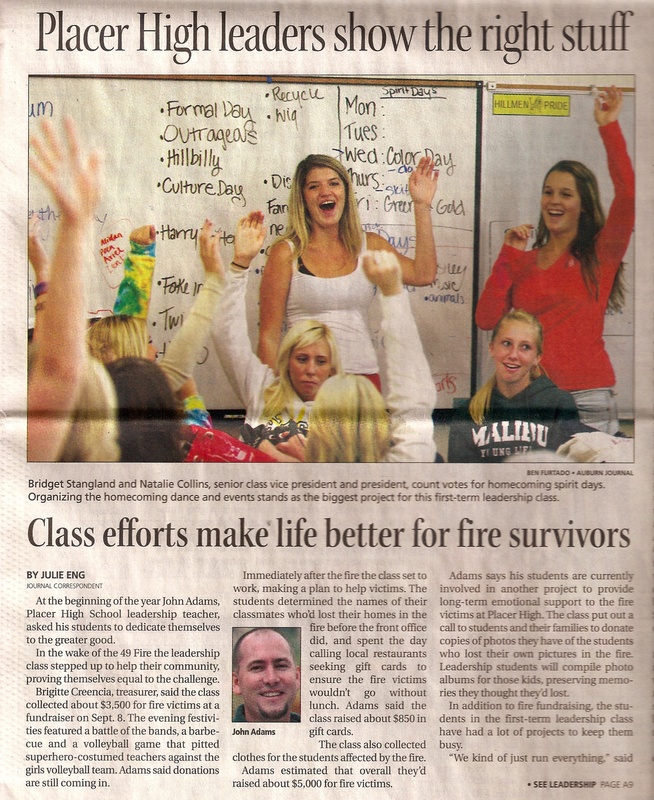 Immediately after the fire the class set to work making a plan to help victims. The students determined the names of their classmates who’d lost their homes in the fire before the front office did, and spent the day calling local restaurants seeking gift cards to ensure the fire victims wouldn’t go without lunch. The class raised about $850 in gift cards and collected clothes for the students affected by the fire, Adams said. He estimated that overall they’d raised about $5,000 for fire victims. Adams says his students are currently involved in another project to provide long-term emotional support to the fire victims at Placer High. The class put out a call to students and their families to donate copies of photos they have of the students who lost their own pictures in the fire. Leadership students will compile photo albums for those kids, preserving memories they thought they’d lost. In addition to fire fundraising, the students in the first-term leadership class have had a lot of projects to keep them busy. “We kind of just run everything,” said junior Richelle Rock. Junior Riley Stoltenburg said she and some other juniors recently formed a committee to help welcome new students to Placer High. They also mentioned the class’s involvement with the “smoothie crew,” where leadership students aid the special education classes in collecting money for smoothies they make and sell in classrooms on campus. At the moment, the major focus is homecoming week. On Monday the class voted to choose a theme and spirit days. Adams, who is new to the leadership class this year, said he was surprised by the extent to which the students were involved on campus. “What I was amazed at was how much they do that I never knew about,” he said. He emphasizes three steps with the students in their projects: big goals and small steps, make their day, and finish strong. Adams hopes these guidelines will teach the kids to produce successful projects that have a positive impact on each student at Placer High, and to work with others. For example, he said, the class “finished strong” at the rally last Friday by doing a thorough job cleaning up afterward, so they wouldn’t be a burden to the janitors. As for the students themselves, they appreciate the opportunity to have a part in running the school. “It’s fun being able to make decisions and have a say in what’s going on,” said senior Elizabeth Keim. On the list of things you don’t want to share your local river with, soiled diapers rank pretty high. Unfortunately, diapers are just one of the many kinds of refuse that litter the shores of the American River. Fortunately, you can do something about it this weekend. On Saturday Auburn’s Protect American River Canyons, sponsored by the Sierra Nevada Conservancy’s Great Sierra River Cleanup, will kick off the 25th biannual American River Cleanup. Starting at 8 a.m., PARC officials and volunteers will begin collecting river litter. They’ll pick up everything from smashed computers and TVs to beer bottles and foam cups. This year there will also be a Canyon Keeper-led interpretive hike on the historic bridges and natural history of the Confluence Area. If you’re interested in volunteering, check in at the PARC info booth at the confluence area on Saturday to register and receive a trash bag, supplies and a map. Eric Peach, PARC conservation chairman, said there are several reasons the cleanup is so important. As Auburn residents shop to gear up for a great party, local businesses reap the rewards of sponsoring the Black & White Ball. Heading into the final week before the event, the ball’s Web site lists over 60 different sponsors, many of them stores located in Auburn. 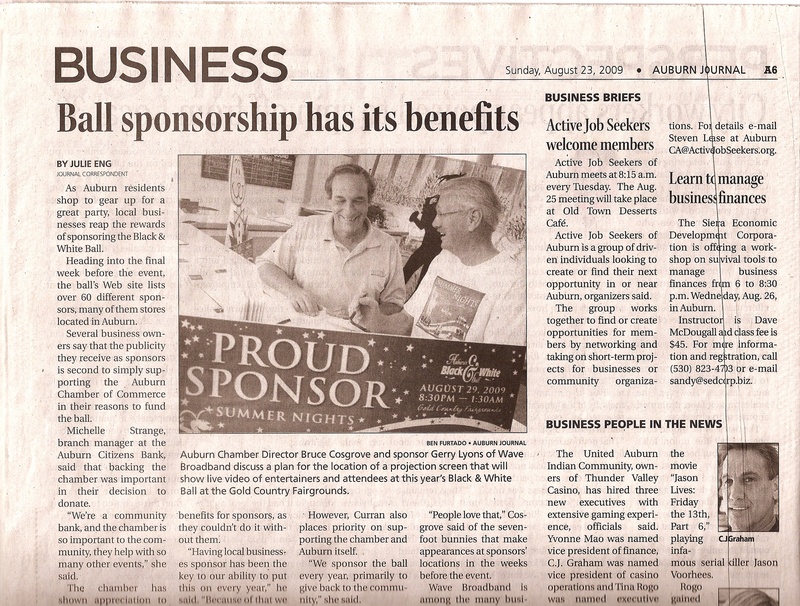 Several business owners say that the publicity they receive as sponsors is second to simply supporting the Auburn Chamber of Commerce in their reasons to fund the ball. Michelle Strange, branch manager at the Auburn Citizens Bank, said that backing the chamber was important in their decision to donate. “We’re a community bank, and the chamber is so important to the community, they help with so many other events,” she said. For many young people today, when it comes to clothes, less fabric is more fashionable. Teachers and administrators have been battling rising hemlines and sagging pants for the past several years, and the resulting ever-changing dress codes have left students and their parents wondering, what is appropriate to wear to school? Locally, dress codes haven’t been too much of a problem, for students or the administration. According to David Horsey, Placer Union High School District superintendent, students at area high schools have generally adhered to dress codes, which has allowed for somewhat lenient rules. 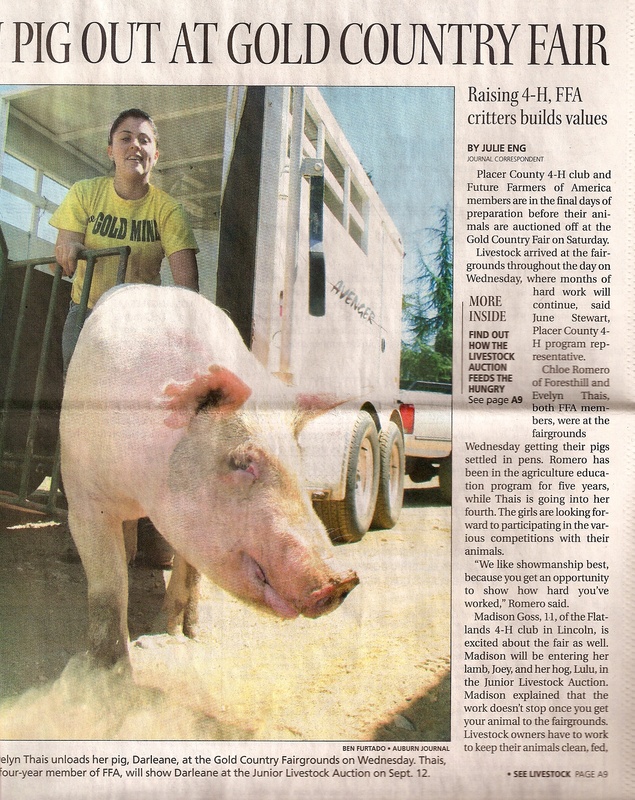 Placer County 4-H club and Future Farmers of America members are in the final days of preparation before their animals are auctioned off at the Gold Country Fair on Saturday. Livestock arrived at the fairgrounds throughout the day on Wednesday, where months of hard work will continue, said June Stewart, Placer County 4-H program representative. Chloe Romero of Foresthill and Evelyn Thais, both FFA members, were at the fairgrounds Wednesday getting their pigs settled in pens. Romero has been in the agriculture education program for five years, while Thais is going into her fourth. The girls are looking forward to participating in the various competitions with their animals. Though the Auburn Chamber of Commerce is counting this year’s Black & White Ball as a success, some attendees say it was not the party they remember from years past. Saturday night’s ball was moved from its traditional Downtown location to the Gold Country Fairgrounds, which left many Auburn residents feeling like they’d paid $70 to go to the fair. Nell Curran, co-owner and manager of Bootleggers Old Town Tavern & Grill, said that though they enjoyed serving food at the Ball, she has heard some complaints. Over the past couple of months, several Chana High School students were given an outdoor alternative to the typical summer job. Chana was awarded a $21,500 grant as part of the American Recovery and Reinvestment Act, which the school’s special education program used to refurbish a garden, and to hire students to do it. Sharon Williams of the Golden Sierra Job Training Agency acted as the liaison between the grant and the Placer Union High School District. She explained that in order to qualify for employment paid by the grant, students had to have a low-income, disability, or other circumstances that might make it difficult for them to find a job. 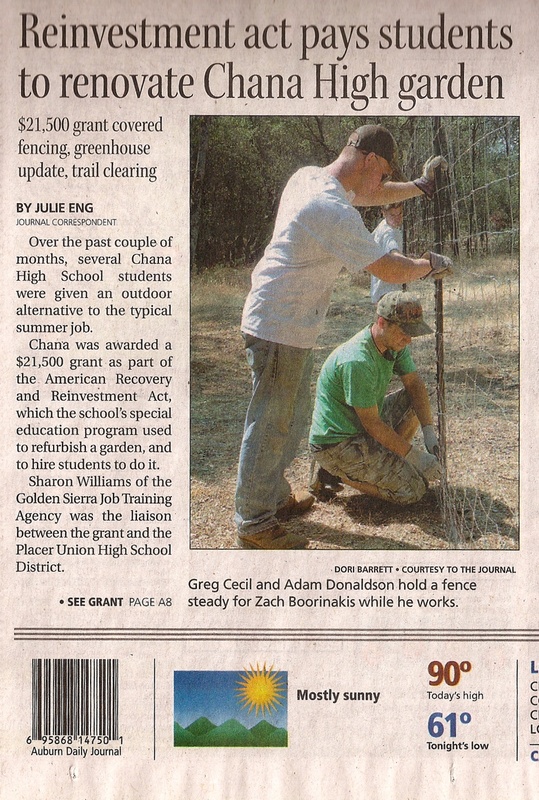 The students were paid minimum wage and supervised by Chana High teachers in rebuilding a greenhouse, re-fencing the garden, and clearing a trail to a picnic area and volleyball court. Don Joye, project organizer and garden class teacher, was one of several Chana teachers who devoted their time this summer to working with the students. He looks forward to continuing the progress made over the summer with the agriculture program into the school year, and plans to add goats and lambs to their farm area. Joye hopes the students will be able to expand their agricultural education to include working with the animals and learning about their care and use. Chana is one of a few Auburn-area schools that have student gardens and agriculture classes to educate students about farming and growing their own food. Those who farm for a living in Placer County are often vocal about supporting agricultural education in schools. “School gardens and school farms are an excellent way for students to learn about where their food comes from, to and gain some respect for local farmers,” said Karen Killebrew, president of PlacerGrown, when asked about the project. Of the five students who stuck it out for the entire six weeks, Samual Perry and Brent Freeman will be returning to Chana in the fall to enjoy the fruits of their labor. Among them is a beach volleyball court, which teacher Tad Eichman and the students stumbled across while clearing the area of debris. Eichman, who has worked at the school for 11 years, said he had no idea the court was there, but it has made a great addition to the picnic area. Teachers noticed the students seemed to take pride in their work. Chana educators agreed that project organizer Joye was a key player in making the project successful. It was “extremely gratifying”to see the program he had been advocating for years receive funding and have an impact on his students, Joy said. He credits the project’s success to students Greg Cecil, Adam Donaldson, Zach Boorinakis, Samual Perry and Brent Freeman, and their hard work. Originally published in print and online at The Auburn Journal. Though June has passed, the Auburn community isn’t finished celebrating Father’s Day. 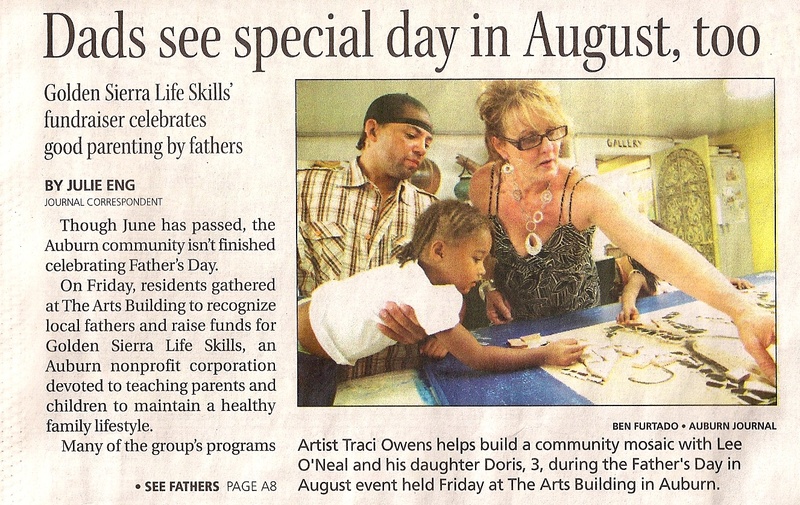 On Friday, residents gathered at The Arts Building to recognize local fathers and raise funds for Golden Sierra Life Skills, an Auburn nonprofit corporation devoted to teaching parents and children to maintain a healthy family lifestyle. Many of the group’s programs focus on male involvement in childrearing, making the 100th anniversary of the recognition of Father’s Day the perfect opportunity for a fundraiser. She and her team will start walking on Saturday for 24 hours in hopes of helping reach that goal. 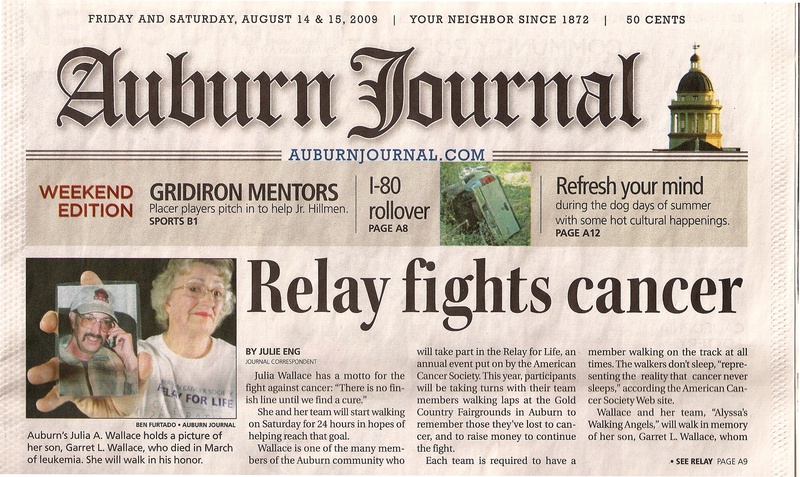 Wallace is one of the many members of the Auburn community who will take part in the Relay for Life, an annual event put on by the American Cancer Society. This year, participants will be taking turns with their team members walking laps at the Gold Country Fairgrounds in Auburn to remember those they’ve lost to cancer, and to raise money to continue the fight. Each team is required to have a member walking on the track at all times. The walkers don’t sleep, “representing the reality that cancer never sleeps,” according the American Cancer Society Web site. Wallace and her team, “Alyssa’s Walking Angels,” will walk in memory of her son, Garret L. Wallace, whom she lost to leukemia in March, and in support of her granddaughter Alyssa. Eleven-year-old Alyssa was diagnosed with brain cancer when she was 6, and has since endured chemotherapy, radiation treatment, and surgery in her five-year fight with medulloblastoma, a type of brain tumor most often diagnosed in children. Wallace first participated in 2004, and for her the walk has become more than just a fundraiser. “It helps to walk the anger off,” she said. She works year-round to raise awareness for her own family’s struggle, and for the American Cancer Society. For family members like Wallace and for cancer survivors, the relay serves not only as a means of raising money, but as a place to connect with and support one another. Wallace says she was asked to read a poem at the ceremony, but feels she won’t be able to get through the entire piece. Instead, she plans to read a quote from the movie “Generation Gap” – a quote that she lives by. Those looking to support Wallace and others who’ve been affected by cancer can come out and participate in the event on Saturday, or make a donation online. Organizers promise walkers and their supporters will get a lot out of this year’s relay. Relay Chairwoman Kim Lightfoot said that in addition to the walk itself, several events are planned to get the community involved. She encourages those so inclined to join in the Relay Runway, where participants create and model outfits from Relay for Life T-shirts, or to stop by and listen to some live music from the Dark Island Trio and the RJ Blues Band. Janet Longoria, the relay co-chairwoman, invites those who wish to get involved to participate in the Luminaria Ceremony. For $10 a candle can be purchased to be lit during the ceremony in memory of someone who has passed, or to honor someone who is still fighting. At 9 p.m. on Saturday the lighted candles will line the track for the walkers. In addition to an increase in new teams, the relay has seen an increase in support from local businesses this year, Lightfoot said. Best Buy’s Auburn store will support the event this year, with their own team of employees walking and a raffle with their products as prizes. Other local businesses are also stepping up with their own teams. Walgreens and Starbucks will be among the local stores whose employees will hit the track on Saturday, while local restaurant Luigi’s Pastaria will be providing lunch. For dinner, the Auburn Masonic Family will raise money to fight cancer serving tacos at the fairgrounds. Wallace encourages everyone to come out to the fairgrounds on Saturday as well.